By the late 80s, the trio of Keith LeBlanc, Skip McDonald, and Doug Wimbish had already made history as the in-house band for Sugar Hill Records. 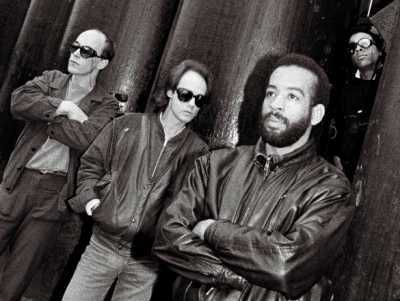 Together they cut the instruments for early hip-hop classics “Rapper's Delight,” “The Message,” and “White Lines.” But as technology evolved to match their creative ambitions, the three linked up with famed UK dub producer Adrian Sherwood to form Tackhead. The industrial hip-hop quartet recorded 3 albums, eventually adding Rolling Stones backing vocalist Bernard Fowler on lead vocals, before going their separate ways in 1990. Though the band never achieved commercial success, their aggressive, experimental sound laid roots for artists like Mykki Blanco and Death Grips. Skip McDonald would go on to achieve success as Little Axe, Doug Wimbish has been a member of Living Colour since 1992, while Adrian Sherwood helped define the 90's industrial sound as a producer for Nine Inch Nails and KMFDM.